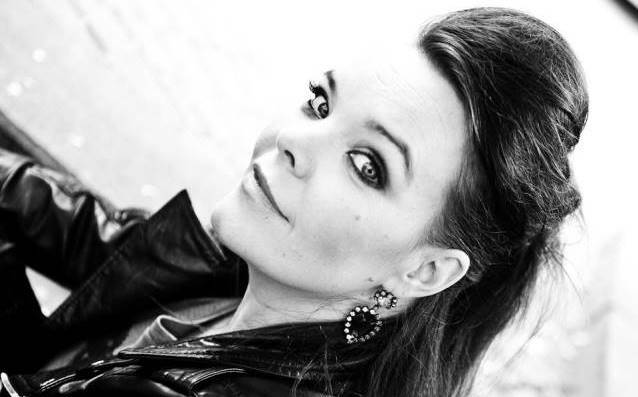 Due to problems with the mastering and the need for more time to make a promotional video, the release date of "Shine", the debut solo album from former NIGHTWISH singer Anette Olzon, has been pushed back a month. "Shine", which was co-produced by Anette Olzon and Johan Kronlund, is a collaboration with some of the most successful teams in rock and pop in Scandinavia: Stefan Örn (songwriter and producer of the 2011 Eurovision Song Contest-winning track "Running Scared") and Johan Glössner. The album was mixed by Kronlund, Nicklas Flykt and Ronny Lahti (known for his work with Loreen and Roxette). The official lyric video for the song "Falling" can be seen below. "The album is very personal with songs I have started writing already in 2009 but also very recent songs. "The overall message of the album is that life can be really dark and filled with hardship and sadness, but you can always choose to see some light coming through, to make you stronger and full of life — making you SHINE… no matter what." Regarding the CD's musical direction, Anette said: "In the end, it is a rock album. Well, a pop rock album, maybe, or would you call it pop metal?" Olzon worked on material for her solo CD in 2009 with Swedish producers Stefan Örn and Johan Glössner. The album was slated to be co-produced by Swedish producer/songwriter Anders Bagge, who has previously worked with MADONNA, CELINE DION, JANET JACKSON and JESSICA SIMPSON, among others. He was also one of judges on the Swedish TV talent competition "Idol" and a producer of the TV series "Made in Sweden". Olzon in 2009 hired a personal manager — the Swedish management company Hagenburg Management, which also represents EUROPE and THE CARDIGANS. Olzon was fired from NIGHTWISH in September 2012 in the middle of the band's North American tour. She has since been replaced by former AFTER FOREVER and current REVAMP singer Floor Jansen.